Beirut: Palestinian president Mahmoud Abbas paid a rare visit on Friday to a Palestinian refugee camp in Lebanon, placing a wreath at the cemetary in the Shatila camp in the capital Beirut. A small crowd gathered ahead of his brief visit to welcome him at the Martyrs Cemetery on the outskirts of the camp, one of 12 housing Palestinian refugees in Lebanon. Also there to welcome the president were a number of youth members of the Fatah party Abbas heads and a boy scout band. Jamil Hassan, 36, had also turned out to see the president, a year after he fled a Palestinian refugee camp in Syria, escaping the violence that has ravaged the country for more than two years. The approximately 470,000 Palestinians living in overcrowded camps in Lebanon are barred from around 70 professions and prohibited from owning property. Their living conditions in camps in Lebanon have been described as the worst for Palestinian refugees anywhere in the region. Hassan said he was shocked by what he had seen of the conditions of his fellow Palestinian refugees in Lebanon since moving to Shatila with his family. “Our brothers here have a miserable existence, I was really surprised to discover it,” he said. “The water is salty and the streets are no more than a metre wide. An estimated 65,000 Palestinian refugees have fled to Lebanon since the conflict broke out in Syria in mid-March 2011, becoming refugees for a second time. Shatila and the neighbouring Sabra camp in Beirut were the scene of a horrendous massacre in September 1982 in which Christian militiamen allied with Israel killed between 800 and 2,000 Palestinians. 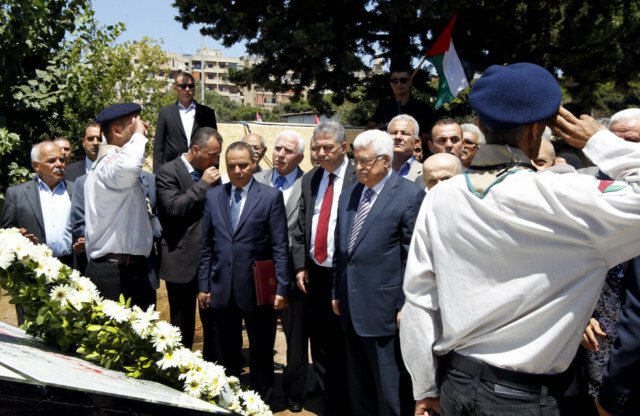 Abbas placed a wreath in the Shatila cemetery where some of the victims of the massacre are buried and offered a prayer at the site before heading to the Palestinian embassy. He is due to leave tomorrow after a three-day trip that included meetings with Lebanese President Michel Sulaiman and Prime Minister Najib Mikati.